This weekend, Rebecca and I decided to team up and help each other out in our pursuits to complete a Double Wedding Ring quilt. I've been eyeing the QAL that The Plaid Scottie hosted some time back and I finally decided to take the plunge (slowly) and put it on my Three Things for the month of August. We decided to set weekly goals and check in with each other to keep the other on track. This week, we're gathering supplies and cutting the fabric for the arcs. I started pulling fabric, I've been hoarding some Fandango that I wanted to use for this. 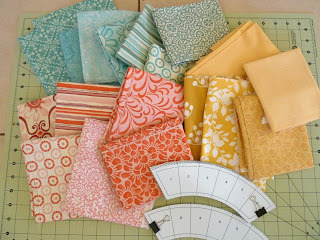 Then, I started looking for my 2 fabrics for my "intersection squares"
I pulled a bunch of fabrics, but I need help! I'm definitely liking the orange and green. The blue and green feel a little dark to me. I agree with Stephanie, the orange looks better for some reason. Looks like it'll be a gorgeous quilt with those fabrics. At first I was leaning toward blue and green, but I'm liking that orange too now! Ah the fated DWR - I ended up using 6 different fabrics for my intersection squares - but 3 were in the same blue family and 3 were in the same brown family... I think it depends on the color you will be featuring in the negative space area (everything but the arcs). If it will be very different I vote the green and orange; if it will be very similar I vote the blue and green to make the junctions pop more. Happy quilting!!!! I think the blue and orange would look great! Orange and green I think, or just to be awkward, orange and blue? Very pretty fabrics! These will make up into a lovely wedding band quilt. I vote for orange and green. Great fabric choices! And it's always easier to get things done when you have someone else working along with you. As far as the squares, my vote goes for blue and green. For once I'm not voting for orange! Blue and green here too! Loooove fandango - I've probably got some scraps I could send if you'd like? personally, I like the blue & green too. Good luck - this will be beautiful! I love your colours! I think the green and the orange. My gut reaction was orange but looking again I think I'd say green and blue! 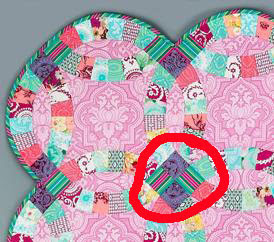 I like the blue and green too, but only if you are using the orange in the quilt too!